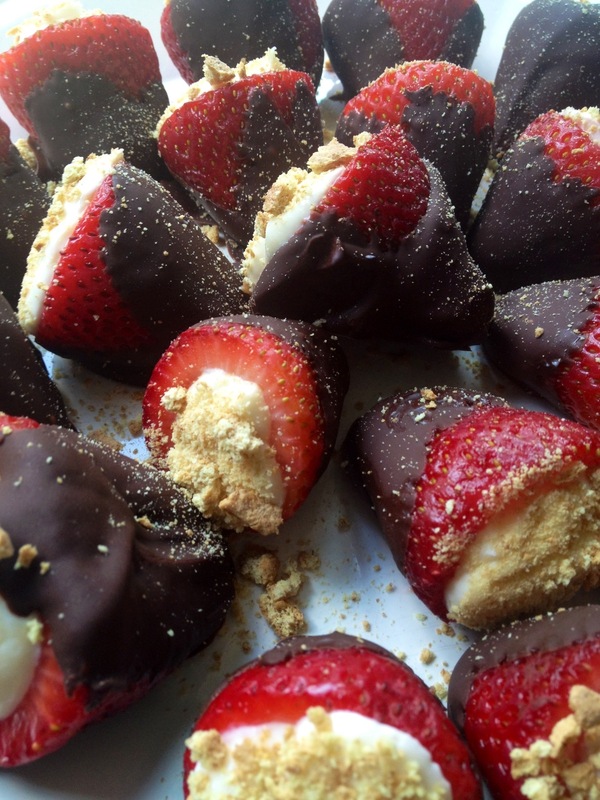 Cheesecake Filled Strawberries…Covered in Chocolate! I recently had some guests over for dinner. I’m planning on sharing each of the recipes with you from the appetizer to dessert, but guess what? I’m starting with dessert! I made chocolate covered strawberries filled with cheesecake! These are no bake (no egg in the filling) and the only time consuming part is hulling out the strawberries. Here’s a little how-to from about.com. The only difference is that you’re going to cut out just a little bit more of the center to fit more filling! Now, I love gadgets but a strawberry huller is something I don’t see the point in buying, but if you have one, use that! Once you rinse and hull your strawberries it’s super easy to complete. I’d say don’t prepare these more than a day in advance, because once you wash berries, their life on this earth is limited! You can always hull them BEFORE washing about a day before, and make the filling the day before and leave it in a ziploc bag. Then when you need to prepare them, wash, fill, and dip in chocolate. Now, you don’t have to dip these in chocolate. They would be delicious without it, if you’re a strawberry purist! The beauty of this recipe is that it can easily be doubled for entertaining at a party (just have a buddy to help you hull!). Wash and hull out your strawberries, throwing out the ones that aren’t a pretty, vibrant red. If they have mushy bad spots, don’t use them! If you’re preparing your strawberries a day in advance, just hull out the strawberries and wash before filling. In a stand mixer or using an electric mixture, beat your cream cheese on medium speed for 3-4 minutes until the cheese is fluffy and smooth. Add the confectioner’s sugar and vanilla and beat until combined. I say 1/4-1/3 cup sugar because if you want them a little sweeter, add some more! Spoon mixture into a large ziploc bag (Tip: Put the ziploc bag into a drinking glass with one of the corners pushed down to the bottom of the glass. This allows you to easily fill with the mixture and puts it right to the corner.) With the bag open, squeeze the filling to the corner of the bag and let the air out. If you’re using this the next day, zip up the bag. If using right away, don’t worry about it. Snip off about 1/2″ of the corner of the bag. Now, grab a strawberry. Put the tip into the center of the strawberry and squeeze from the top of the filling in the bag. Fill the strawberry until a little bit of the filling is coming out of the strawberry. Repeat until all the strawberries are filled. In a microwave safe bowl, put your chocolate chips. Microwave in 30 second intervals until the chips soften (probably about 1 minute total), stirring between shifts. Once the chips are softened, stir until they’re a uniform melted goodness. Grab your filled strawberries. 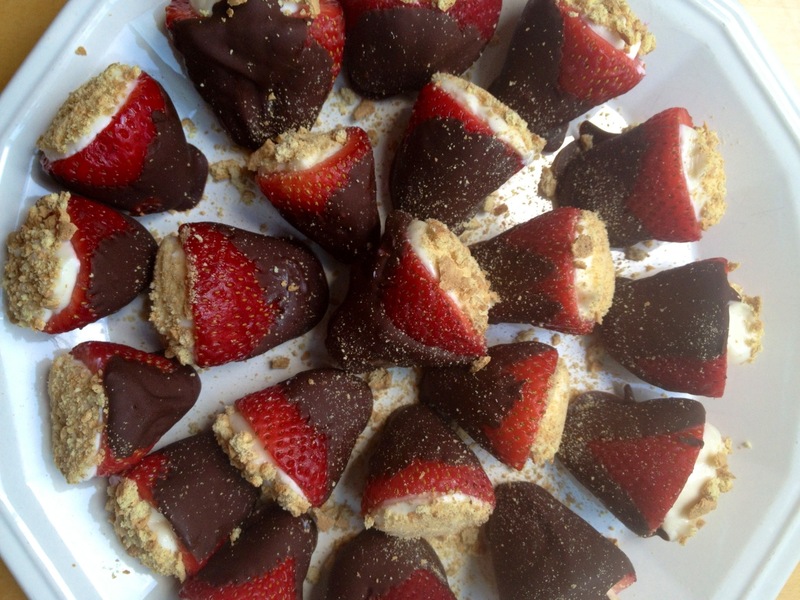 Using tongs or your fingers dip strawberries into chocolate and lay onto a parchment or wax paper lined baking sheet. Repeat until the strawberries are covered. Refrigerate until the chocolate is set, about 1-2 hours. Crush up a graham cracker in a ziploc bag using the bottom of the glass. Pour onto a small plate. Dip the exposed cheesecake end of the strawberries into the crushed graham cracker, placing them onto your serving tray. Repeat until done. Sprinkle with remaining graham crackers. Refrigerate until you’re ready to use them! OK OY MY GOD IM IN HEAVEN , WELL I HAD TO TRY THIS RECIPE ONCE I SAW IT AND I FOLLOWED ALL UR INTRUCTIONS , OOPPPS I FORGOT THE VANILA EXTRACT , BUT NO PROB. STILL TASTED WONDERFUL, AND THE CHOCOLATE STILL NEEDS TO HARDENED , GRRRR MY KIDS ARE ANXIOUSLY WAITIN BY THE FRIDGE LOL. WELL HOPEFULLY THERE WILL BE STILL THERE ONCE THERE READY TO EAT.